Established in 1952, our program offers a 24-month (40 hrs./wk) certificate program that meets the curriculum standards established by the American Society of Radiologic Technologists. The school is accredited by the Joint Review Committee on Education in Radiologic Technology (JRCERT). Graduates of the program are eligible to apply to take the American Registry of Radiologic Technologist national certification examination. Our graduates' pass rate is consistently one of the highest in the country — 100% pass rate for the past 5 years with scores above the national average. Job placement rate, over the past 5 years is 100%. As a radiologic technologist, you have a wealth of career opportunities available to you. Hospitals, health care facilities, physicans’ offices, mobile imaging companies, industrial plants, research centers and government agencies are all in search of skilled radiologic technologists. 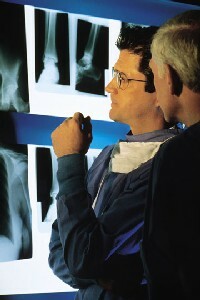 Radiography is the art and science of producing medical images of the human body's tissues, organs, bones and vessels. These images are displayed on a video monitor. The Mission of the Ascension St. John Hospital School of Radiologic Technology is to provide an economically affordable education in the field of Radiologic Technology. This education is for students who will benefit in becoming competent professionals through successful completion of required clinical and didactic courses and certification by the American Registry of Radiologic Technologists. No college credits are transferable to this program, as we are not a credit granting institution. 80% is required in each didactic course and clinicals to be successful. Applications are distributed throughout the year. Deadline for the return of the completed application and admission prerequisites is February 1 for the class beginning the following September. The following application items must be compiled by the student and sent to the Program Director in one envelope packet and must be received by February 1. Completed Application with a $40.00 non-refundable application fee (make check payable to Ascension St. John Hospital). Official* High School transcripts (minimum GPA of 2.5). A minimum ACT (American College Testing) composite score of 18. You do not need to take the optional writing test. (ACT score is usually found on your high school transcripts, as you most likely took it in high school). ACT scores are mandatory, regardless of your educational status or age. If you have not taken the ACT, you must register at your local high school or college as soon as possible or online at www.actstudent.org. To have the test results mailed directly to us, indicate our school code number as 2047. Official* College transcripts (minimum GPA of 2.7) from all colleges and universities attended. A minimum Associates degree is required or enrollment through one of the following colleges or universities that we have articulation agreements with. Three official* letters of recommendation (Letters from family members and friends are not accepted.). Six hours of career shadowing in the radiology department at Ascension St. John Hospital. * Official documents must be sealed and either signed or stamped across the back by the school official or reference. Letters or transcripts that are not sealed or signed appropriately or appear to be tampered with will not be accepted. Additional courses in Psychology, Physics, Basic Life Support, and other science courses. Healthcare experience with direct patient contact. This may be attained in the form of volunteer work. Selection is based on ACT score, educational background, and prior healthcare experience. Students who meet these qualifications will then be scheduled for a personal interview and aptitude test. All factors will be reviewed by the School of Radiologic Technology Admissions Committee. The committee makes the final selection of students. A maximum of 13 students enter the program each September. *We do not accept transfer students from other radiography programs. Personal interviews will be conducted by appointment, if application criteria has been adequately met. Qualified candidates will be required to take the Psychological Services Bureau (PSB) Health Occupations Aptitude Exam. The test is at the student's expense ($25). Student selection for the Ascension St. John Hospital School of Radiologic Technology is non discriminatory with respect to race, color, age, religion, gender, sexual orientation, gender identity, disability, national origin, height, weight, genetic information, marital status, amnesty, and other legally protected status or a status as covered veteran in accordance with applicable federal, state, and local laws. The School of Radiologic Technology offers a diverse and stimulating two year (24-month) program of instruction. It is recommended to students who wish to receive their education at a progressive and active hospital. Ascension St. John Hospital is a designated trauma center offering a wide variety of educational experiences. Students receive didactic instruction and clinical education in all phases of the Department of Radiology. During the two year program approximately 33% of time is spent in academic preparation and 67% in developing clinical competencies. Students will experience a vast spectrum of exams in the hospital Radiology departments, Ascension St. John Hospital; Ascension Macomb-Oakland Hospital, Warren Campus; Ascension Macomb-Oakland Hospital, Madison Heights Campus; St. Clair Orthopaedics; Ascension St. John Hospital at 23 Mile; and Ascension St. John Hospital at 12 Mile. Additional clinical rotations may be added. These assignments serve to enhance the curriculum by providing specialized clinical educational opportunities. Students are responsible for their own transportation to all clinical sites. The school meets the curriculum standards established by the American Society of Radiologic Technology (ASRT), and the American Registry of Radiologic Technologists (ARRT), and is accredited by the Joint Review Committee on the Education of Radiologic Technologists (JRCERT), 20 N. Wacker Dr., Ste. 2850, Chicago, IL 60606-3182. The JRCERT is recognized by the U.S. Department of Education (USDE). The school faculty includes a Program Director, a Clinical Coordinator, Clinical Instructors, Physicists, Radiologists, Registered Radiologic Technologists, and other qualified instructors. The year is divided into four semesters of clinical and didactic education. The fall semester begins the Monday following Labor Day and is 14 weeks in length. This semester concludes prior to Christmas. The winter semester is also 14 weeks and begins the first week of January and concludes in April. The spring semester is 8 weeks in duration and concludes in June. The summer semester is spent primarily emphasizing clinical competency, and is 14 weeks in length. Biannually, the Advisory Committee, composed of the Medical Advisor, faculty, selected managers, lead technologists, clinical instructors, and a member of each class meet to review and discuss various outcomes regarding the students' education and ways to improve it. During the two-year, full time, 40 hours/week program you will rotate through several areas of the Department of Radiology. These rotations are designed to strengthen and supplement clinical skills. Although most of the rotations are during the day, routine afternoon rotations are required to gain experience in trauma radiography. As a student, you will receive an extensive orientation to the hospital and to the field of radiologic technology. The curriculum, approved by the American Society of Radiologic Technologists (ASRT), includes the following courses/units. The School of Radiologic Technology offers a diverse and stimulating two-year (24-month) program of instruction. It is recommended to students who wish to receive their education at a progressive and active hospital. Ascension St. John Hospital is a designated trauma center offering a wide variety of educational experiences. Students receive didactic instruction and clinical education in all phases of the Department of Radiology. During the two-year program approximately 40% is spent in academic preparation and 60% in developing clinical competencies. Students will experience a vast spectrum of exams in the hospital Radiology departments, Ascension St. John Hospital; Ascension Macomb-Oakland Hospital, Madison Heights Campus; Ascension Macomb-Oakland Hospital, Madison Heights Campus; St. Clair Orthopedics; Ascension St. John Hospital at 23 Mile; and St. John Surgery Center. Additional clinical rotations may be added. These assignments serve to enhance the curriculum by providing specialized clinical educational opportunities. This course will provide the student with an overview of radiography and it's role in healthcare delivery. Student responsibilities will be outlined. Students will be oriented to academic and administrative structure, key departments and personnel, basic radiation protection techniques, medical ethics, and to the profession as a whole. This course will provide the student with the concepts of patient care, including considerations for physical and psychological needs of the patient and family. Routine and emergency patient care procedures will be described, as well as infection control procedures utilizing Standard Precautions. This course is designed as a continuum of the basic concepts of patient care including consideration for the physical and psychological needs of the patient and family. Routine and emergency patient care procedures are described, as well as emphasis on basic pharmacology and recognition of basic knowledge of EKG and arrhythmias for the imaging technologist. This unit introduces the student to equipment and exams performed in mobile radiography. Equipment manipulation and basic positioning considerations will be demonstrated. This unit will provide the student with knowledge to process radiographic images. Requirements for the processing area will be identified. Film, film holders, imaging plates and intensifying screens will be discussed. Processing procedures and artifacts will be described. This course will provide the students with the elements of medical terminology. An introduction to the origins of medical terminology will be addressed. A word building system will be introduced, and abbreviations and symbols will be discussed. Also introduced in this course will be an orientation for the understanding of radiographic orders and an interpretation of diagnostic reports. This course will provide the student with knowledge of anatomy and physiology of the: cells and tissues, respiratory system, digestive system, urinary system, fluid and electrolyte, acid and base balance. Prerequisite: Anatomy and Physiology I. This course will provide the student with knowledge of anatomy and physiology of the: skeletal system and muscular system. Prerequisite: Anatomy and Physiology II. This course will provide the student with knowledge of anatomy and physiology of the cranium and special senses. Prerequisite: Anatomy and Physiology III. This course will provide the student with knowledge of anatomy and physiology of the: circulatory system, lymphatic system and immune system. This course will identify imaging modalities that utilize transverse anatomy. Diagrams and computed tomography scans of the head, thorax, abdomen and pelvis will be reviewed. The basic principles of CT will also be explored. This course introduces the student to positioning terminology, radiographic examinations of the chest, abdomen, gastrointestinal tract, urinary tract, and biliary tract. Consideration will be given to the production of radiographs of optimal diagnostic quality. Laboratory experience will be used to compliment the classroom portion of the course. Students will be required to position classmates and phantoms during laboratory sessions. Prerequisite: Radiographic Procedures I. This is a continuation of Radiographic Procedures I and includes routine positioning of the upper and lower extremities. Prerequisite: Radiographic Procedures II. The course includes radiographic positioning and laboratory practice of the cervical, lumbar, and thoracic spines, sacrum and coccyx, sacroiliac joints and skull. Prerequisite: Radiographic Procedures III. The course includes radiographic positioning and laboratory practice of the facial bones, paranasal sinuses, mandible, nasal bones, orbits, and special positions of the skull. Prerequisite: Radiographic Procedures IV. This course includes the radiographic positioning and laboratory practice of the temporomandibular joints, mastoids and sternum. Special radiographic examinations of the upper and lower extremities and the spine will be studied. Geriatric, pediatric and mammographic imaging are also covered. Prerequisite: Radiographic Procedures V. Special considerations and positioning of the trauma patient will be addressed. This course will provide the student with knowledge of factors that govern radiographic density/image brightness. Laboratory experiments will be utilized to demonstrate clinical applications of the theoretical principles and concepts. Prerequisite: Principles of Radiographic Exposure I. This course is a continuation of the factors that govern radiographic density/image brightness. An introduction to the factors that govern radiographic contrast will also be discussed. This course will provide the student with a working knowledge of image evaluation and critique. As the student progresses through the curriculum, the complexity of images to be evaluated and critiqued will increase. Some radiographic pathology discussion will be included during these sessions. This online course will provide the student with a knowledge of basic physics. Structure of the atom, electromagnetism, magnetism, electrostatics, and electrodynamics will be studied of the x-ray circuit, rectification, x-ray tubes, and production and characteristics or radiation. Prerequisite: Radiation Physics I. This online course will provide the student with knowledge of the x-ray circuit, rectification, x-ray tubes, and production and characteristics of radiation. This online course will provide the student with an overview of the principles of radiation protection. Radiation protection responsibilities of the radiographer for patients, personnel and the public are presented. The concepts of As Low As Reasonably Achievable (ALARA), and stochastic and non-stochastic effects will be discussed and compared with the concept of Absorbed Dose Equivalent. Regulatory agencies will be identified and agency involvement in radiation protection will be discussed. This online course will provide the student with an overview of the principles of the interaction of radiation with living systems. Radiation effects on biologic molecules and organisms with factors effecting biologic response to irradiation are presented. This course will provide the student with an introduction to the concepts of disease. Pathology and disease as they relate to various radiographic procedures will be discussed. This unit will provide the student with the theory and practice of the basic technique of venipuncture and the administration of contrast media and/or intravenous medication. This course provides the student with tools to become a committed, team oriented, employable individual who is proud of his/her profession. Resume writing, interviewing, and job search will be explored. This course provides the basic concepts of principles and operation of digital imaging systems found in diagnostic radiology. Factors that impact image acquisition, display, archiving and retrieval are discussed. Review of materials presented during the two-year program. This online and classroom hybrid course is designed for preparation of the National Registry Examination. Course content, additions or deletions are at the discretion of the instructional staff. Changes are made to reflect technological advances. Clinical rotation start times vary based on your clinical education site assignment, depending on when that clinical site opens and/or when you will receive the most education from your time assigned there. You receive a clinical rotation schedule two months in advance. Our program is designed to provide you with the skills and knowledge necessary to secure a future in radiologic technology. The faculty, consisting of radiographers, radiologists, physicists and other healthcare professionals, provide you with the kind of experience and preparation you need to succeed. a. Students will apply positioning skills. b. Students will select appropriate technical factors. c. Students will practice radiation protection. a. Students will use effective oral communication skills. b. Students will practice written communication skills. Students will use critical thinking and problem solving skills. a. Students will manipulate technical factors for non-routine examinations. b. Students will adapt positioning for non-routine patients. c. Students will critique images for improvement. a. Students will discuss the importance of professional growth. b. Students will present information on our profession or our program to prospective students, new students, or communities of interest. c. Students will exhibit professional behavior in the clinical setting. Credentialing examination pass rate is defined by the JRCERT as the number of graduates who pass, on the first attempt, the American Registry of Radiologic Technologists certification examination compared to the number of graduates that take the examination. Program completion rate is, as defined by the JRCERT, calculated by dividing the number of students who completed the program within a cohort by the number who enrolled in the cohort initially and subsequently. Students who leave or do not graduate on time for any reason, such as medical leave, personal choice, or course failure, are considered as not completing the program with the original cohort. After successful completion of the following, the graduate is eligible to apply to take the American Registry in Radiologic Technology (ARRT) national certification exam. Note: Contact hours and course content are frequently revised to reflect current practices in radiologic technology. Tuition for 2018 is $3,000/yr. Students are responsible for their book expenses and online course fees (approximately $1,700 total), a $150/yr. electronic record keeping fee, school supplies and uniforms. The application fee, electronic record fee, and PSB Aptitude test fee are non-refundable. Should a student who is accepted into the program leave the program before January 1 of their first year, $1,500 will be refunded to them. After January 1 of the first year, no tuition or fees will be refunded. Students requiring special assistance (including those affected by the American with Disabilities Act) should inform the instructor of any special conditions pertaining to the students learning. Ascension St. John Hospital respects the privacy of student information. In accordance with the Family Education Rights and Privacy Act (FERPA), we restrict internal access to student information to persons with a legitimate need-to-know. Further, we do not release private student information to any third party without the prior written consent of the student.